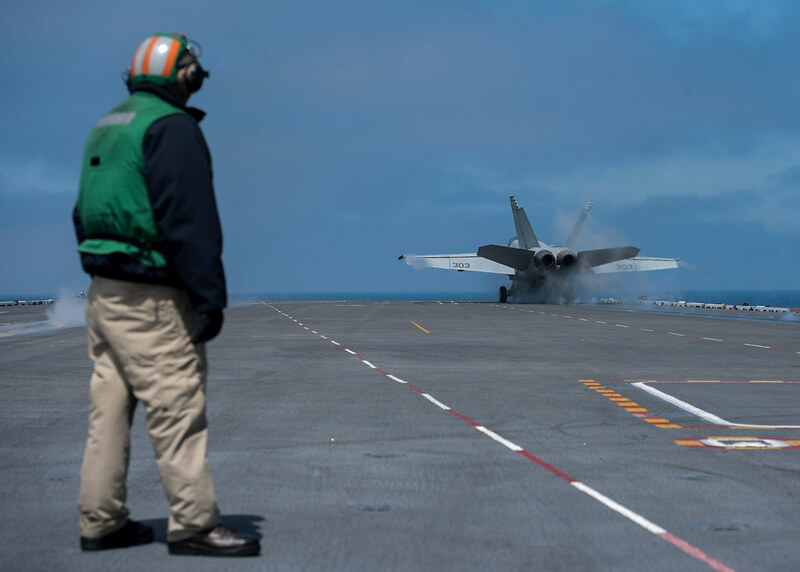 PACIFIC OCEAN - USS John C. Stennis (CVN 74) successfully completed its flight deck certification, Sept. 6, with the help of Carrier Air Wing (CVW) 9. During the certification, Commander, Naval Air Forces, Pacific, evaluated the ship's ability to safely launch and recover aircraft. Flight deck certification is a major milestone for John C. Stennis during its training cycle after early completion of a six-month planned incremental availability (PIA) at Puget Sound Naval Shipyard and Intermediate Maintenance Facility in August. "Our main weapon system is the delivery of ordnance through strike fighter aircraft," said Cmdr. Pavao Huldisch, the air officer aboard John C. Stennis. "Unless we're certified, we can't carry aircraft, we can't launch them, and we can't recover them. 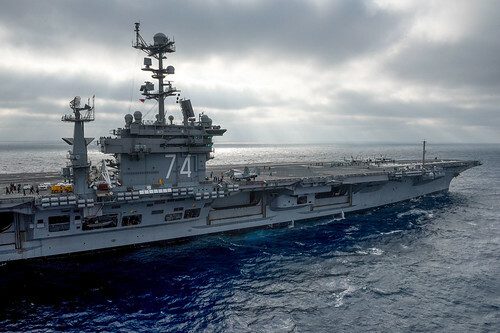 The ability to conduct the mission of this aircraft carrier is what we accomplish by certifying the flight deck and getting back in the fight to do the nation's business." To certify, John C. Stennis was required to conduct at least 120 day and 40 night aircraft launch and recoveries over the course of two days, as well as demonstrating proficiency across a wide range of flight related operations to include multiple aircraft emergency drills. The ship accomplished more than 200 launches and recoveries, more than meeting the certification requirements and gaining valuable additional training for both pilots and flight deck crews. "It's hard to go from a maintenance mindset to an operational mindset," said Aviation Boatswain's Mate (Handling) 1st Class William Duskin, the flight deck leading petty officer, from Cochran, Georgia. "That's the reason why we have flight deck certification. We had a long break during PIA where we weren't doing flight operations. We need to make sure we can still follow the correct procedures and do it safely." The preparation for flight deck certification began before PIA ended, with flight deck personnel conducting training, firefighting drills and briefs. For many new crewmembers this was their first time conducting flight operations. "Not too many people get to say they've been on an aircraft carrier and watched these machines take off and go from zero to whatever they go. It's impressive," said Airman Garrett Pensak, from Bellefonte, Pennsylvania. This underway was also the first time John C. Stennis and CVW-9 operated together since 2016. Flight operations take a lot of coordination between ship's company and the air wing squadrons, and flight deck certification was an opportunity to renew that relationship. "Teamwork is everything," said Aviation Ordnanceman Airman Tony Garcia, assigned to the Black Aces of Strike Fighter Squadron (VFA) 41, from Edinburg, Texas. "Without ship's company, we can't do our job; and without us, ship's company can't do their job. Teamwork is a big deal around here." After completing flight deck certification, John C. Stennis will be completing a series of work ups and certifications leading to a scheduled 2018 deployment.